It’s the last of the Balance Power bars of the future (which could all use sauce). Actually, this one has an odd crispiness to it that is really quite good. It’s still a bit dry but not a dusty or a pasty dry. Sort of like if you had a really compact rice crispy bar without the marshmallows that you accidentally sat on. That sort of dry yet crispy. I kinda like it. And what’s not to like about the inclusion of chocolate chips? Strangely, these chips are less dark bitter Asian chocolate and more American Milk chocolate. Not that I’m complaining, just observing. 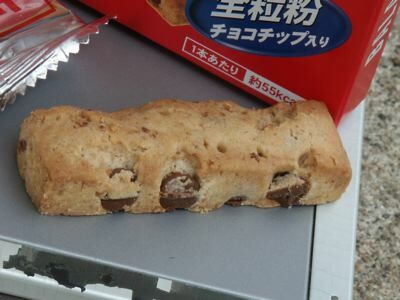 I have no idea what a ‘zenryu’ is though, chocolate chip? Wheat? Fun crispity bits? 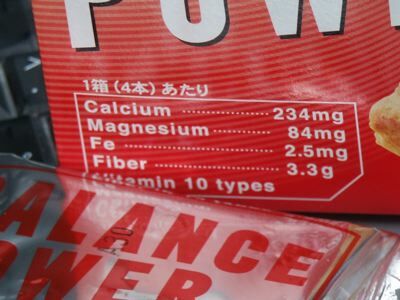 My translations page fails me as does my Google-fu but I’m willing to try other zenryu flavored snack foods because nothing in this Balance Power flavor is making me hate it. 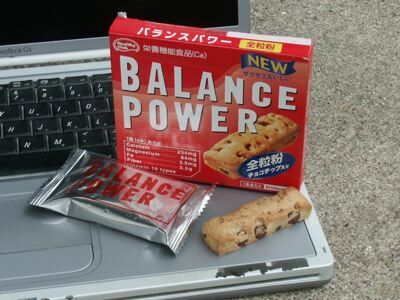 As for taste, Balance Power (zenryu) is kinda like a dry wheaty chocolate chip cookie but not as sweet. And not as cookie crispy. And with Rice Crispy bits added to it. Pretty tasty, actually. In the giant buffet table of Japanese Snack Foods, I’d grab a couple of these for nomming (and perhaps some vanilla ice cream) and I might even come back for seconds. The cocoa Balance Power had a delicious cocoa flavor but zenryu seems the least dry of the three with their nicely sized chocolate chips and crispy rice bits. More fiber than caramel but less than cacao. Hmmm! 3.5 wasabi peas out of a possible 5 wasabi peas rated snack.